Although few people know it, one of the most recyclable materials in circulation today is asphalt. In fact, this commonly used parking lot and roadway material is nearly 100 percent recyclable, should the need arise to actually remove your asphalt, that is. 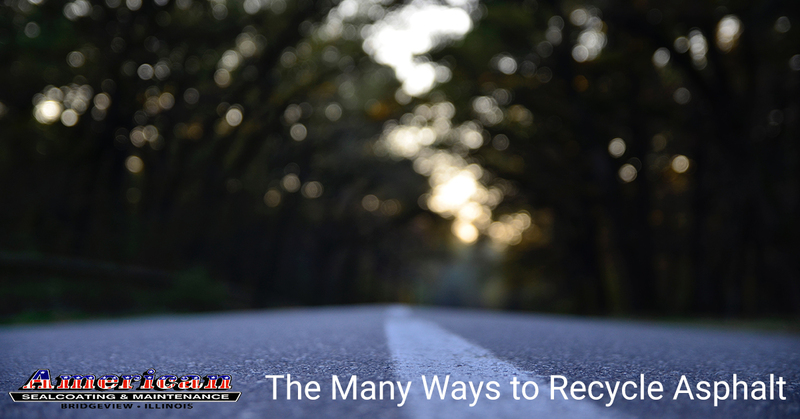 The best way to recycle your asphalt parking lot, driveway, or road is to repair your current surface, rather than opting for a new surface at all. Asphalt paving is designed to last for many, many years in even the roughest conditions, provided that regular maintenance and sealcoating services are provided. Even if you have been less-than-great about maintaining your asphalt paving, our Bridgeview sealcoating and asphalt repair team can likely still save your surface. So, even if you’re looking at a cracked and potholed parking lot, you shouldn’t ever resort to a new parking surface until you’ve spoken with our sealcoating experts first! After a little repair and a cost-effective sealcoating is applied to your asphalt paving, it will be as if you have an all-new surface for a fraction of the cost. In order to recycle a badly damaged parking surface or roadway, an asphalt recycling crew would remove, collect, and heat up the asphalt in a large hot box, essentially melting it back into a pliable surface. 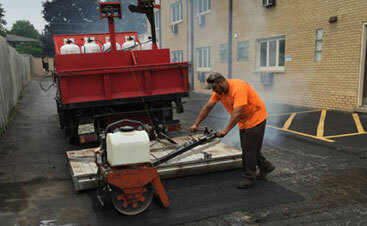 From there, the asphalt can be re-installed, or saved for a later use, in a way similar to virgin asphalt. Since asphalt is primarily made up of oil, the value of recycled versus virgin (new) asphalt is largely dictated by oil prices. Although asphalt can be recycled and reapplied, many asphalt paving customers prefer a virgin asphalt installation over recycled. 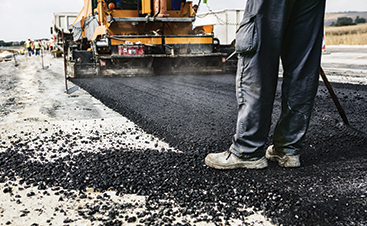 Often, recycled asphalt is used as a sort of patching for existing asphalt surfaces or for moderately-sized installations, but is currently less common in large commercial applications. Many people believe that recycled asphalt is not as strong as virgin asphalt, which is widely considered the trade off for its environmental and cost-effective benefits. Since the act of recycling asphalt on a large scale is still relatively knew, an average lifespan for large-scale commercial applications is still not possible to discern. Another major drawback to this type of installation is that the muddled recycled asphalt, which likely includes worn gravel, line paint, dust, and other contaminants, is more likely to track and stain surrounding materials after installation, this can even cause oil stains in people’s homes and vehicles from their shoes! To prevent this, most recycled asphalt is finished with a sealcoating as soon as it dries, but this delay and additional labor cost does somewhat work against recycled asphalt installations. 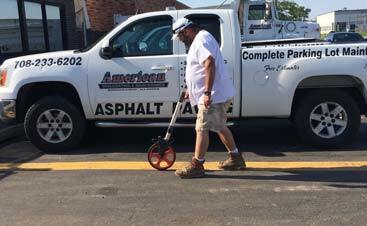 Crack and pothole repair – This simple “patching” method allows your current asphalt surface to gain back the functionality of a new surface. While the color of the patch won’t match the surrounding area, if you pair this with a sealcoating surface, then you’ll retain the patching benefits without the change in appearance! Infrared repair – This is another way to “recycle” your current asphalt, as it heats your existing asphalt in its place (without removing it to a hot box) to allow it to become pliable again. From there, it is graded, rolled, and re-sealed to give a like-new surface to your asphalt without ever having to tear it out; plus, it takes about 1/4 the time as other repairs. Sealcoating – Of course, the best way to maintain your parking lot will involve regular sealcoating services. Depending on the condition of your surface and the damages it is subject to, sealcoating needs can range from a couple to many year intervals. With each sealcoating, you’ll essentially gain a new-looking surface that also protects the asphalt beneath. Learn more and contact our Bridgeview sealcoating team today!